Destination weddings are becoming increasingly popular. Many couples are choosing to walk away from the stress of a big wedding at home, cutting their guest list down to their nearest and dearest, or perhaps eloping, and going somewhere fabulous to tie the knot. Brits can very easily have a legal wedding in New York, and what a city that is to celebrate in! There really is something for everyone in New York City, so no matter what your interests are, you will be able to put a unique stamp on celebrating your wedding there. Central Park is a tranquil and picturesque area in the middle of Manhattan. Wed in Central Park helps couples to plan their weddings in this unique location in one of the world’s greatest cities. 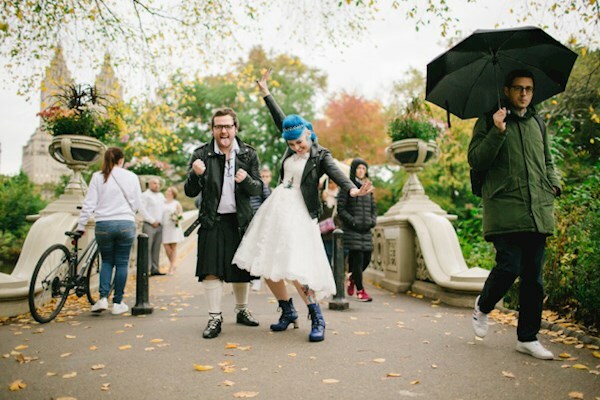 Hillary, a social worker and Ben, a tattooist, brought twenty-six guests to their wedding in Cop Cot in May. Cop Cot is a rustic wooden structure, stark and bare in the winter, but covered with foliage in summer. They had a large engagement party back home in Australia, so they wanted to have a small and intimate wedding. They said that their guests were thrilled to have the excuse to visit New York. In total they stayed in New York for two weeks in a rented apartment in Williamsburg, Brooklyn. They said that they loved the area’s chilled out vibes, and preferred it to Manhattan. After their wedding they took their guests to eat at a restaurant in Chelsea and then went on to a rooftop bar afterwards. Pinky and Bones are musicians from Scotland, they got engaged after Pinky’s sister’s wedding, a destination wedding in Crete. Bones had always said that she would never get married, but they were chatting and Pinky said “I think we should get married” and without over thinking it Bones said, “OK”, but as they started to discuss what they might want from a wedding, they realized that they were actually going to do this! 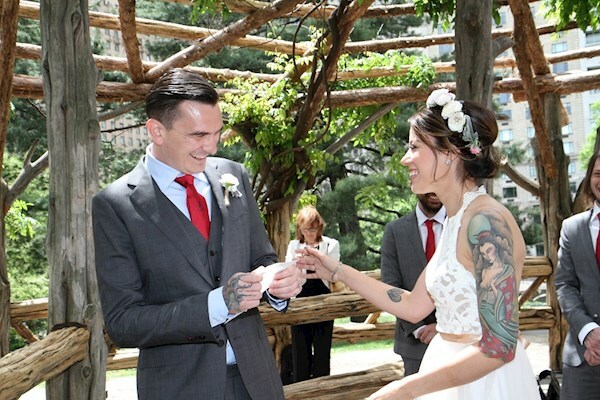 Bones surprised her groom the night before they left for their New York vacation by telling him that she had organised a wedding in Central Park while they were there. 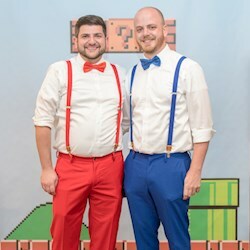 The main reason why Bones was not keen on getting married was the idea of having a big wedding, and all the pressure that goes along with one, so an elopement was right for them. 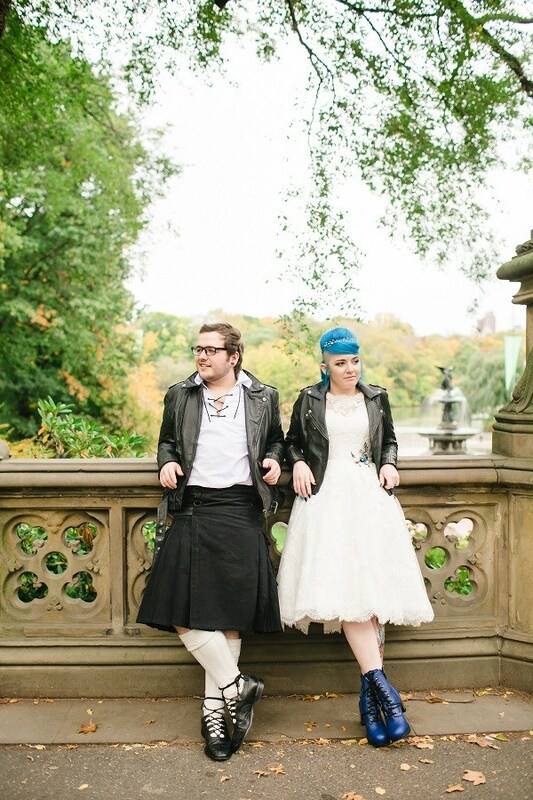 Pinky wore a black kilt and traditional Ghillie shirt and Bones wore an ivory tea-length dress, they wore matching black leather jackets with skulls embossed on the backs and the bride had dyed her hair blue for the occasion. Rivka and Dani brought their family and friends from pretty much all over the world to witness their wedding. Rivka is originally from New Zealand and Dani is from England. They met when Dani was backpacking through New Zealand, and since they married they have continued to travel all over the world together. New York seemed like a great location for a wedding for couple with family as spread out as theirs – it was kind of middle for them all. Rivka wore a Grecian-inspired dress originally designed for a bridesmaid and Dani wore a suit that she had tailored in Thailand. The couple stayed in a rented apartment in Soho for ten days. 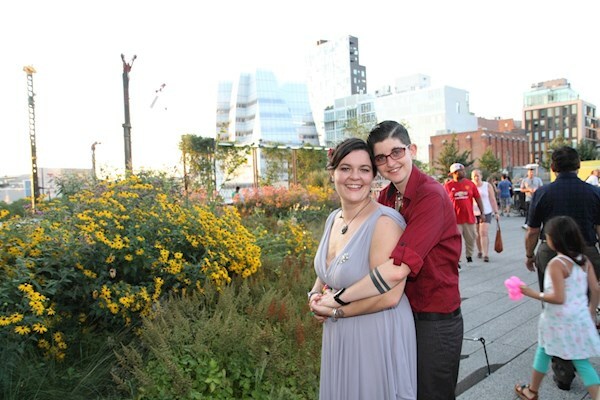 They hired a private room in a restaurant in Chelsea for their reception, which was close to the Highline park, so they took some photos there as the sun was setting. Tatiana and Fabio are both originally from Brazil, but they currently live together in New York. 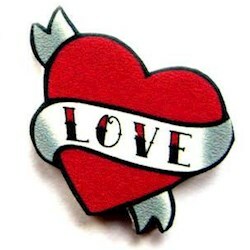 They met at Tatiana’s friend’s tattoo studio in Chelsea, where Fabio works as a tattoo artist. We arranged for this friend who introduced them to be the one who conducted the ceremony. Tatiana and Fabio live just a few blocks from Central Park, and it is where they had their first date, so it felt like the obvious choice for them. 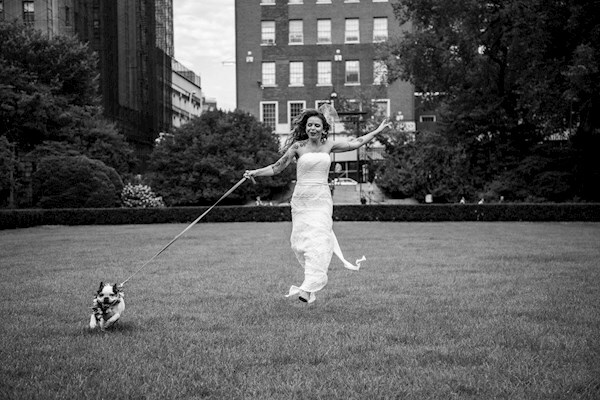 The couple are locals so they had lots of friends and family at their wedding – and their dog! That evening they had a sunset cocktail party reception. Emma and Paul eloped from their home in Leeds to get married in Cop Cot in May. 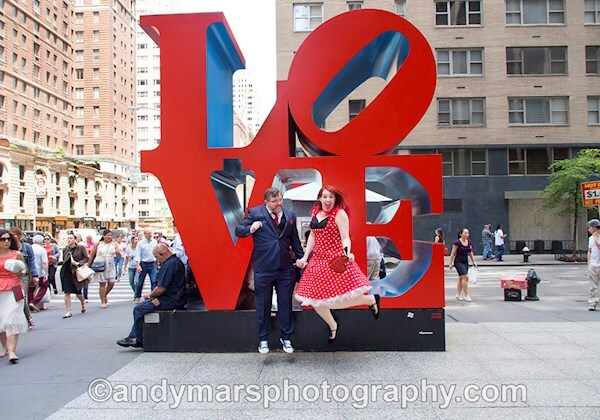 We arranged for their photographer to meet them at their hotel an hour or so before their wedding so that they could take some photos on the streets of New York on the way to their wedding. Paul proposed two days before Emma’s twenty-ninth birthday. He gave her gifts that were all clues to the surprise that he would take her to New York for her thirtieth the following year. 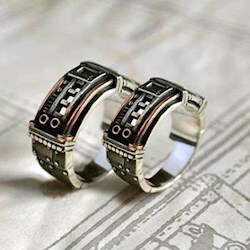 Then he decided to propose right there and then, which had not been his original plan, but he said that it felt right. So, they decided to get married while they were there. Emma chose to get married in a red spotty 50s style dress to match her red hair! After their wedding they went to a cat café in Chinatown, watched the sun set from the Top of the Rock, and then went to the Hard Rock Café for dinner. They had an American-themed BBQ party with their friends and family when they got home. 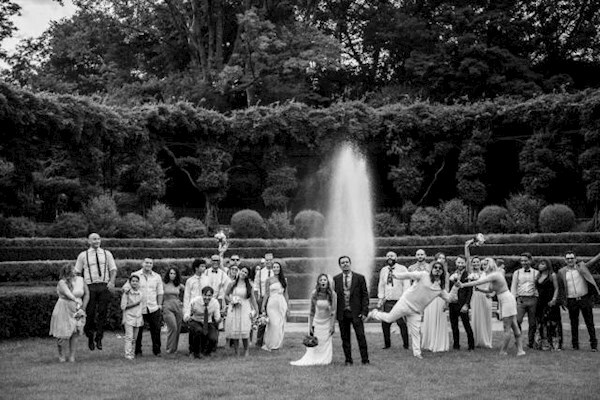 It is pretty simple to get married in Central Park. 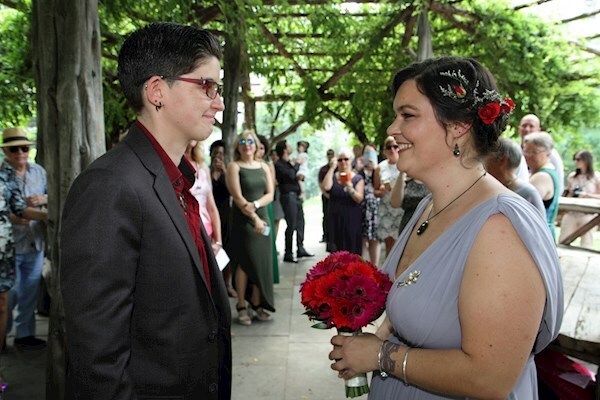 A couple is legally required to pick up their marriage license from City Hall for $35 then Wed in Central Park can help them do all they need to organise a wedding that suits the couple and their needs. 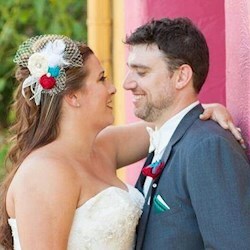 They discuss everything a couple wants for their ceremony, and then each ceremony is written especially for each couple, so they are all unique. 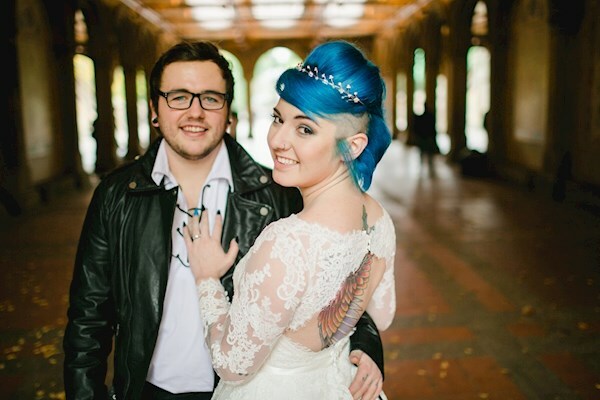 You can get married anywhere in Central Park, and a couple can say whatever they want to each other in a ceremony! 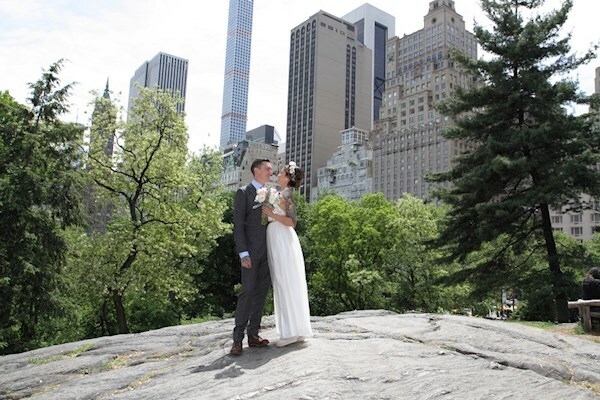 Thanks to Claire from Wed in Central park for this guest blog post. If you'd like to find out more, visit the website or better still get your arse down to the Tying the Nott wedding fair in Nottingham on February 25th where you can speak to Claire in person!